A gorgeous home on a quiet, private street, 175 yards to the beach access with both ocean and sound views. This home is loaded with amenities, perfect for vacationing families and the ideal location to enjoy beautiful sunrises and sunsets. Rain or shine there are many activities inside and out to keep your family happy. Plenty of separate adult and kid spaces. Rainy beach day? No problem. Watch a movie in the theatre room, enjoy a game of pool, or play one of the many board games. There are a variety of books and puzzles for both adults and children. 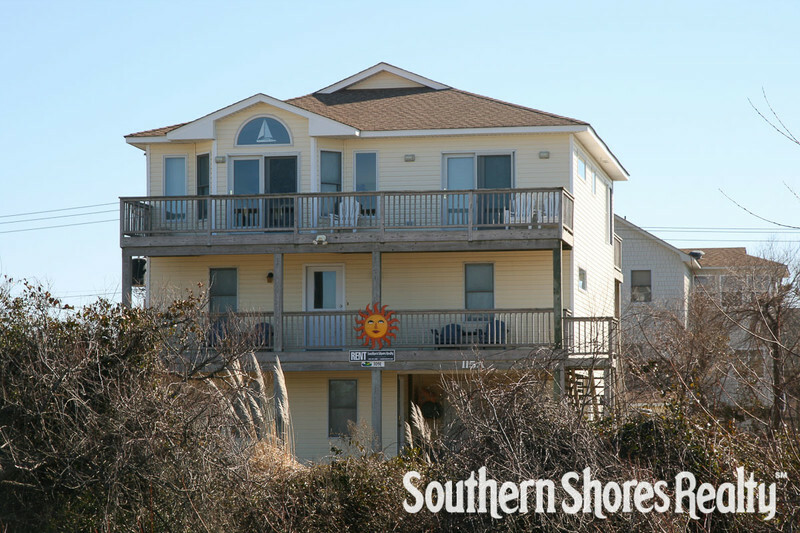 After you have enjoyed your week at the beach in this home, you will feel so rested and relaxed you truly will be "Walking on Sunshine"! Master bedroom (with King and 25" LCD HDTV), bath with tub/shower; home theater room with 55" LCD HDTV with Blu-ray player and surround sound, movie library, leather sofas, recreation room with pool table and wet bar and refrigerator, CD player. Full bath. Large great room with 46” LCD HDTV, Blu-ray player, sunroom with computer table and card table; dining table seats 10; well-equipped kitchen with quartz counter tops and 4 counter seats; master bedroom (with King, 25” LCD HDTV, deck access and bath with tub/shower); half bath.